While at BKV (formerly MRI, MRA, Hangar 18, and Marketing.Comm) I worked on several sales force training games and some consumer-oriented site traffic generation games. Some examples are here, including "Air McNair Challenge" and "International Squares." 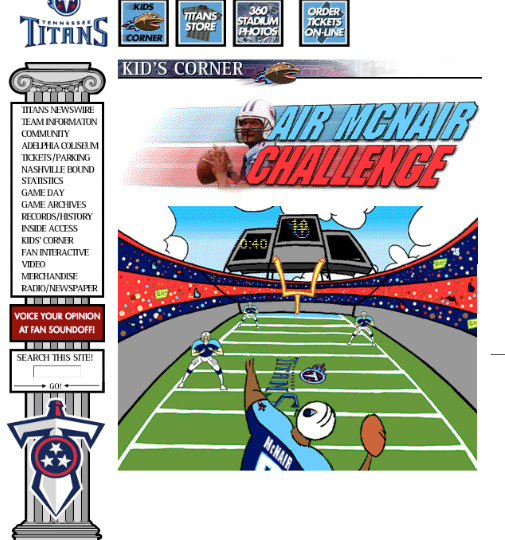 Above: Tennessee Titans “Air McNair Challenge” web-based Flash game; illustrations by artist Tim Grace with Flash development work by Byron Hester. Above: Loading screen from the International Squares CD-ROM game. This was a “Hollywood Squares” -style sales force training reinforcement tool for International sales staff. The game used faux celebrities such as “Kam Shaft,” “Paul Piston,” and “Starsky & Clutch;” illustrations by artist Tim Grace with Flash development work by Byron Hester. Above: The main screen from the International Squares game. Above: Question screen from the International Squares game.